Good morning lovelies! It is just another glorious Monday. Even if Monday came equipped with a pot of gold, it would still be tough to stomach. But...to brighten the day, we are talking about a punchy color. Purple! That's right. All shades and hues of purple. Lilac, plum, fuchsia, lavender and mauve. You name it, we are loving it. The accents add such a playful and charismatic aura to the space. Let's just face it. We are purple people eaters this a.m.
Love this space. 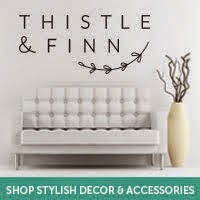 All of the big elements in the space are shabby chic and calming and then you get to the accessories. 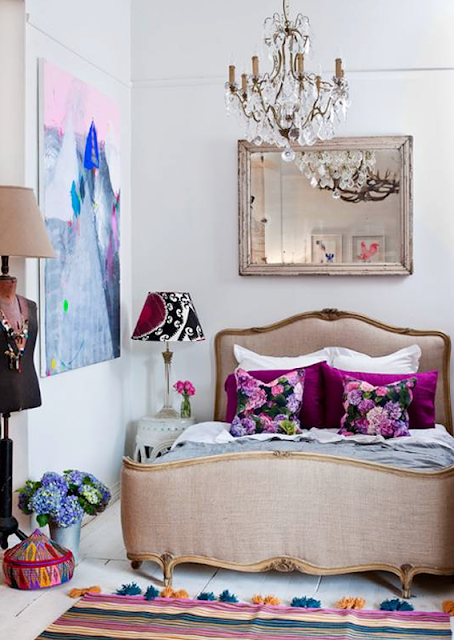 We adore the fuchsia accent pillows and the other hints of purples around the space. Total funky and eccentric use of purple here my dears. Amazing va va voom lampshade and also ceiling to floor window treatments. DRAMA. 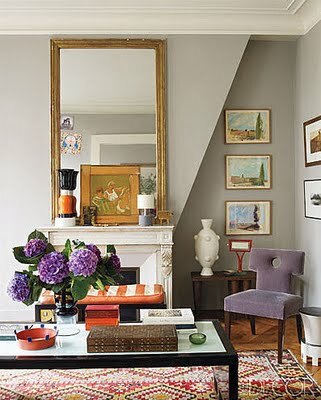 We are obsessed with this quiet and eclectic sitting room. 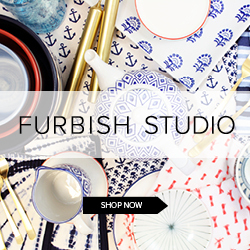 This space is full of character and thoughtfully placed accessories. Not to mention the lilac velvet chair and the gorgy flowers. Just the right amount of pop! We have been dying over this image for sometime now. 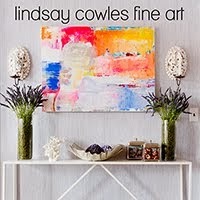 This console table is out of hand. Now, if someone gave me this on a Monday, it might change my thought of Monday's. No lie. Not to mention all of the major purple accessories accompanying this table. The sea fans, the flowers, the shells, the books!! Oh my. All different shades, shapes and sizes. We are equal opportunity when it comes to purple. Totally extreme. 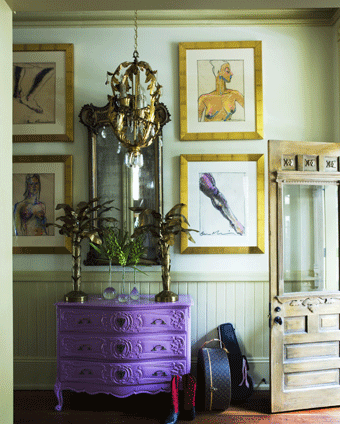 Love the fuchsia striped wall and all of the purple art adornments. To die. Wonder if a man designed this?? Hmmm. We are going to go with a solid no on that one. The grape chandelier? Amazeballs. Amazingly blue walls. Amazingly amazing gallery wall. Amazing plum and mauve bedding and even more amazing plum patterned floor art. Larving it all! Every element in here is so unexpectedly cohesive in the space. Again with the gorgeous purple furniture. Statement. Piece. Serious. 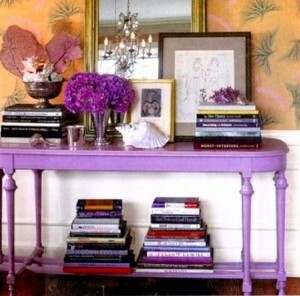 Before my dying day, I will have a lilac entryway table. It is going to happen. This one happens to be offset by amazing art including shades of purple. Gorg. Happy. Monday. Here is to wishing you all arrive on a pot of gold today or maybe a purple entryway table. Whatever your heart desires! I love love that first bedroom and although I'm not a purple lover, I adore lavender...especially when it's with coral!! 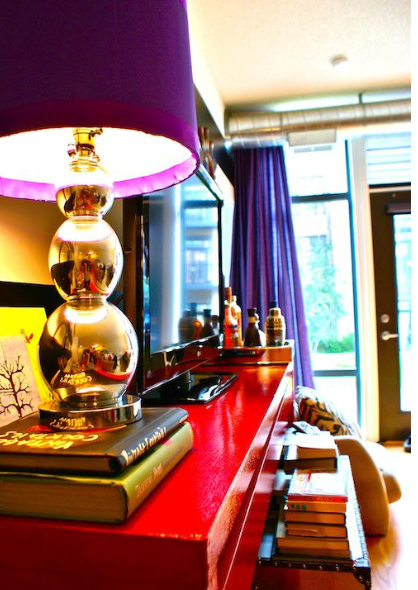 Love that lamp with the purple velvet shade!! Bonus Jackpot menanti anda ! That fuchsia striped wall is so striking, unique but not for me. Jeweled by Alyssa Giveaway Reminder! Tailored Skirted Tables: To buy or to DIY?